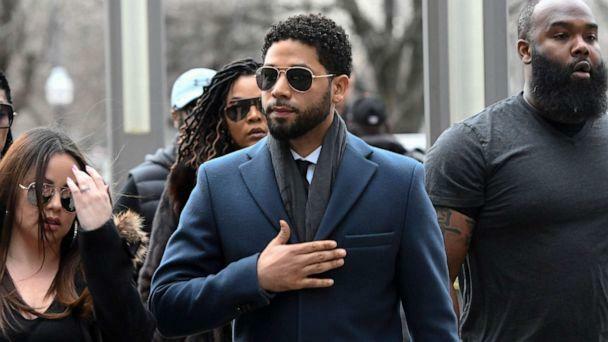 Two days after prosecutors in Chicago unexpectedly dropped all charges against Jussie Smollett, city officials gave the "Empire" actor a week to pay back $130,000 used to investigate a hate crime in January that officials said was bogus. Smollett missed the deadline, and the city threatened a lawsuit on Thursday. A day later, a lawyer for the actor responded by saying Smollett "will not be intimidated into paying the demanded sum." "Mr. Smollett vehemently denies making any false statement to the City of Chicago, or to any individuals investigating" the alleged attack, attorney Mark Geragos said in a statement addressed to Chicago's Department of Law on Friday. "All criminal charges against Mr. Smollett from this incident have been dismissed and his record has been sealed. Thus, your claim that Mr. Smollett filed a false police report and orchestrated his own attack is false and defamatory." Geragos' letter followed a statement from Bill McCaffrey, a Department of Law spokesperson, issued Thursday night that said: "Mr. Smollett has refused to reimburse the City of Chicago for the cost of police overtime spent investigating his false police report on January 29, 2019. The Law Department is now drafting a civil complaint that will be filed in the Circuit Court of Cook Country." The lawsuit would be filed "in the near future" and the city "will pursue the full measure of damages allowed under the ordinance," McCaffrey concluded. Chicago asked Smollett, against whom 16 felony charges had been filed, for an "immediate payment" of $130,106.15 "in an attempt to resolve this matter without further legal action," according to a letter obtained last week by ABC News. The letter asked for the payment within seven days and said additional fines were possible. Geragos' statement accuses the city of Chicago of making threats in "bad faith" against his client and says filing a lawsuit against Smollett requesting repayment is "unconstitutional," an erroneous attempt "to try to get a second bite at the apple once charges against a criminal defendant have been dismissed." Smollett, who insists he's been "truthful and consistent on every single level since day one," was released after forfeiting $10,000 -- 10% of his $100,000 bond -- and performing a few hours of community service. Joe Magats, the first assistant state attorney in Illinois, told ABC Chicago station WLS, "We stand behind the investigation and the facts revealed," and, "We believe he did what he was charged with doing," and, "This was not an exoneration. To say that he was exonerated by us or anyone is not true." Chicago Mayor Rahm Emanuel said dropping the charges against Smollett "is without a doubt a whitewash of justice."